Numerous studies have shown that there is a clear correlation between having Modic changes in the spinal vertebrae and suffering back pain, particularly in Modic Type 1. Patients with Modic changes have higher pain intensity than patients with back pain caused by musculoskeletal strain, where the bone tissue remains normal. 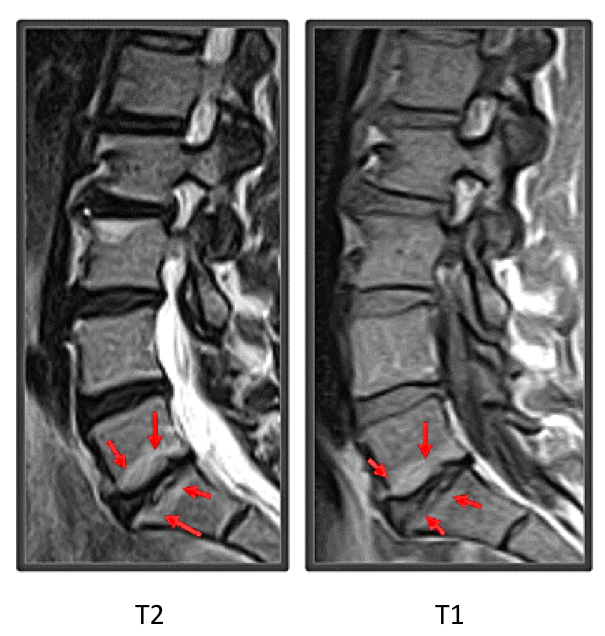 75-80% of patients with Modic changes suffer from constant back pain. The intensity of the pain may vary during the day in relation to physical activity, but it never goes away. 68% of people identified with Modic changes are so afflicted with pain at night that when they turn over in their sleep, they are awoken because of the pain this causes. 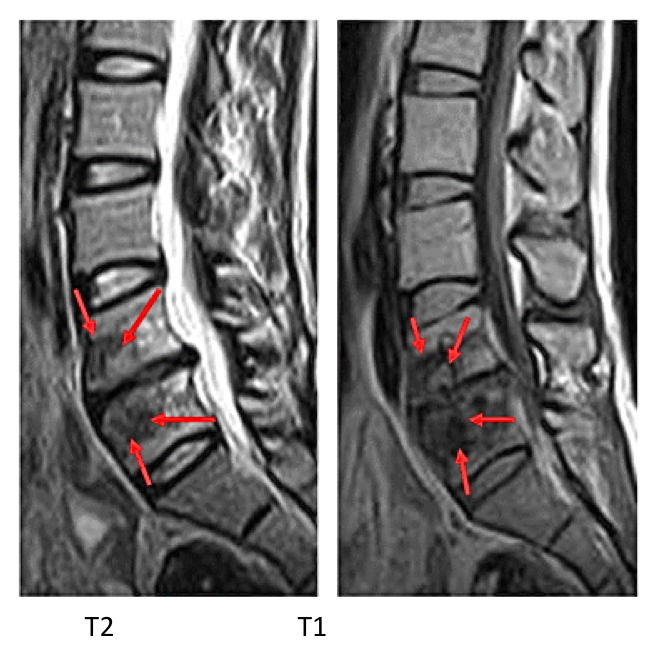 In their original study, Modic et al analysed histopathologic sections and concluded that Type 1 changes correspond to the inflammatory stage of degenerate disc disease (DDD) and indicate an ongoing active degenerative process. Whereas Type 2 changes represent the fatty stage of DDD and are related to a more stable and chronic process. Modic changes to the spine can be classed into three specific disorder types. 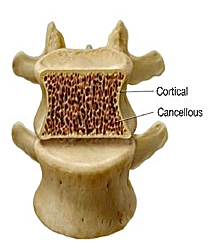 In a healthy spine, bone has a scaffolding of tiny threads of bone, the trabeculae. The spaces between these trabeculae are filled with red bone marrow, which produces blood cells. The healthy bone is also called Medic Type 0. 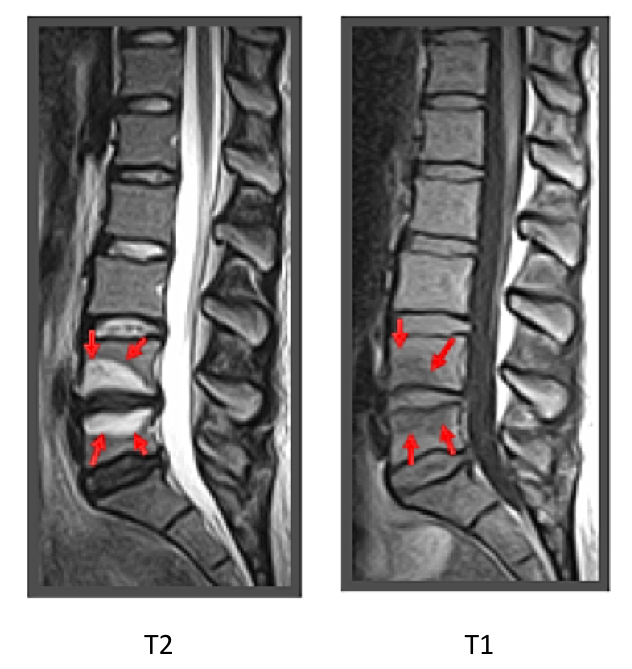 In Modic Type 1, many of the trabeculae are fractured, shorter and wider than normal. This makes the bone structure uneven. Instead of healthy red bone marrow, the spaces between the trabeculae have been replaced with a clear liquid, similar to that found in a blister. In addition to this, new nerve fibres, which transmit pain, have grown into the bone. In Modic Type 2, there are also broken trabeculae, which have become shorter and wider than normal. Again, this bone structure is uneven. However, instead of healthy red bone marrow in the spaces, in Modic Type 2, these spaces are filled with a yellow fat, similar to the fat we accumulate on the hips and stomach. Often a Modic Type 1 switches to a Modic Type 2.